Sma ll but mighty, the KBL Hurricane packs the tanning power and high-tech features to be the new highlight of your indoor tanning business and the best stand-up tanning option in your market. The Hurricane’s stylish stand-up design and smaller frame will help you re-energize your space and revitalize your business, while its striking exterior draws in customers old and new. Fifty 180w lamps with total tanning power of 9,000 watts will please even the most discerning tanners in the 11-minute exposure time. Comfort is never in question with the Hurricane’s powerful bodyCool fan, ACS Intelligent technology and central exhaust. megaVoice takes the customer’s perception of a futuristic tanning experience to the next level, as a pleasant voice guides them through the unit’s operating functions. Optional vibraNano puts the icing on the cake, appealing to a whole new segment by incorporating a fitness routine into the tanning session. vibraNano utilizes a movement process that simulates walking, where the muscle reflexes of the right and left halves of the body are triggered in turns. In doing so, the muscles are activated in different ways, individually geared toward your customer‘s individual goals! 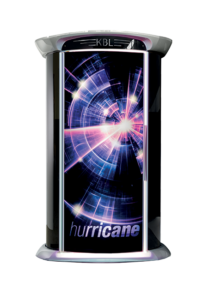 If you want to step up your stand-up tanning options and blow away the competition, the KBL Hurricane is the proven, potent and profitable unit your business needs. Call PC Tan at 800-FAST-TAN for more information.